4. Remote control: Wireless transmission distance can reach up to 200 meters. 5. Built-in speakers, and support two external speakers. Superb designed mold with Horn access slot. Can directly installed for the Horn and louder voice. 7. Support lithium batteries or 10 * AAA batteries (optional), support external 12V power. 8. USB 2.0 Transfer rate for Download. 9. Built-in 110 bird sounds. 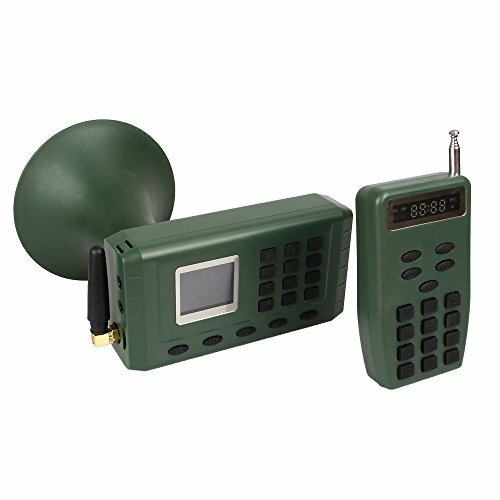 With Remote control,The remote distance can reach up to 200 meters. Built-in 35W of 130dB speaker. With Li-battery and support 10*AAA batteries(Optional).